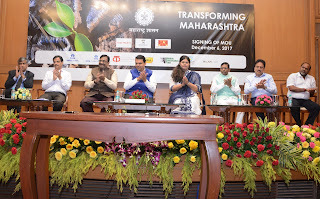 Mumbai, 7th December 2017,Maharashtra Village Social Transformation Foundation (MVSTF) initiative with a mission to transform 1,000 villages across the state today signed Memorandum of Understanding (MOU) with leading corporates and philanthropists in a bid to empower and push development work in rural part of the state. In an effort to converge the developmental efforts between the Government of Maharashtra and Corporate India, MVSTF enables a public-private partnership in development work at grass root level. The partners provide financial resources to MVSTF, along with domain knowledge and expertise to bring about lasting change in key development areas. The MoUs were signed with the intent of furthering collaboration between the Government of Maharashtra & Corporate India. The MoUs were signed in the presence of Chief Minister of Maharashtra, Shri Devendra Fadnavis and other dignitaries like – Smt. 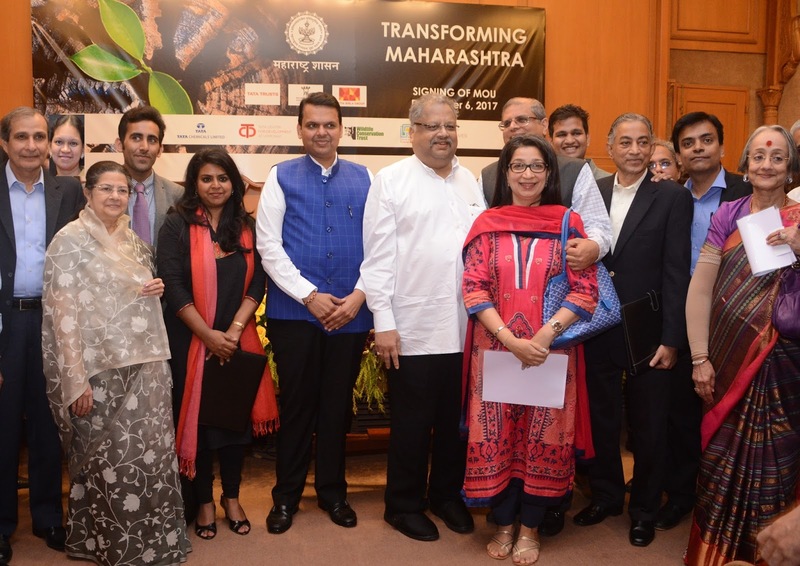 Rajashree Birla, Idea Cellular, Mr. Amit Chandra, ATE Philanthropic Foundation, Investor Mr. Rakesh Jhunjhunwala, Mr. Radhakrishna Damani, Founder, D-Mart, Mr. Hemendra Kothari, Wildlife Conservation Trust, Mr. Vallabh Bhansali, Enam Financial Consultants Mr. Krishnan Dharmarajan, CDFI & Mr. John Santosh, BillionLives, and Mr. Ramnath Subramaniam, CEO, MVSTF signed the MoUs on behalf of MVSTF. Also present at the occasion were Sudhir Mungantiwar, Minister of Finance & Planning Forests, Girish Mahajan, Cabinet Minister for Water Resources, Pankaja Mundhe, Minister of Rural Development Women and Child Welfare Vishnu Sawra, Minister Of Tribal Development Mahadeo Jankar, Minister for Animal Husbandry, Dairy Development and Fisheries Development, Ranjit Patil, Minister of State Home(Urban),Urban Development, Skill Development and Entrepreneurship, Law & Judiciary, Parliamentary affairs Sumeet Mallik - CS- Government of Maharashtra, Praveen Pardeshi - ACS to CM. Under the guidance and mentorship of Additional Chief Secretary Shri Praveen Pardeshi, VSTF is gaining rapid momentum with 310 villages already covered under the program and close to another 300 villages to be added shortly. 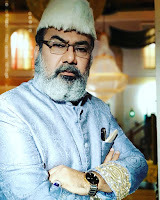 His huge hands on experience, passion and commitment has resulted in convergence of various government schemes and innovative interventions by corporates. Secretary Rural Development, Shri Aseem Gupta is a Director on board of MVSTF. MVSTF is a unique Public-Private Partnership in the country. MVSTF provides opportunity to the youth in the form of Chief Minister’s Rural Development Fellowship (CMRDF) programme. CMRDFs are assigned to a Gram Panchayat and work in close association with local administration to prepare and implement participatory development plans. In the 1st phase, 143 Fellows have been on-board since April, 2017 to serve 310 Villages across 12 Districts of Maharashtra. The Fellows create community-led and participatory Village Development Plans (VDP), which have been approved in the Gram Sabhas. The Fellows are now working with the local administration and District Mission Council (DMCs) to implement the plans. Several initiatives, including setting up of solar electrification projects, last-mile digital connectivity, promotion of local Self-Help Groups, are being piloted in these villages.